MANILA (Mindanao Examiner / 30 May) – The militant trade union, Kilusang Mayo Uno, on Wednesday said local authorities are to arrest a Filipino political activist who led an anti-Arroyo protest in New Zealand during a state visit by the Philippine leader. It said it uncovered a plot by the Philippine government to arrest Dennis Maga, spokesman for the “Free Ka Bel Movement” and a senior KMU member. Maga’s protest during President Gloria Arroyo’s state visit in New Zealand drew international media attention after he was joined by hundreds of unionists in denouncing the spate of political killings in the Philippines and the continued detention of a militant lawmaker Crispin Beltran, also known as Ka Bel. In Wellington on Monday, Maga stood in a cage outside The Beehive as Arroyo and Prime Minister Helen Clark held a media conference. Maga said his country needed to stop human rights abuses and free Beltran who has been in prison for more than a year on what his supporters said were spurious coups plotting charges. “Arroyo is known for her vindictiveness and we will not be surprised if she personally instructed the Bureau of Immigration and Deportation (BID) to arrest Dennis Maga once he gets into the country,” Elmer Labog, KMU national chairman, said in a statement sent to the independent regional newspaper, the Mindanao Examiner. Labog said they were informed by BID sources that an arrest order has been issued for Maga once he arrives home Sunday. “The case of Maga will serve as a litmus test on whether Arroyo’s word to New Zealand Prime Minister Helen Clark on respect for human rights will hold water. Any harassment on Maga will erase Arroyo’s ‘wolf in sheep’s clothing’ strategy when it comes to human rights,” Labog said. Labog group also appealed to Clark to issue a statement against the possible arrest of Maga. “Many of our brothers and sisters in the trade union movement in New Zealand have expressed concern on Maga’s safety and have made commitments to pressure their own government to uphold human rights," he said. The National Distribution Union on Wednesday also said that supermarket distribution workers in New Zealand have walked out in support of Maga after learning news of his possible arrest in Manila. It said Maga was calling his one-year old son, Elijah, to say happy birthday when he learnt that his house was under surveillance by police and that he faces arrest on his return. Maga was invited by the NDU and Unite Union to talk to workers about the repression and killings of trade unionists, journalists and church leaders by the Filipino military and police. Two-hundred previously locked out NDU Progressive distribution workers gave Maga a standing ovation and walked out to mount a spontaneous show of solidarity on the same spot where they held their pickets last year. 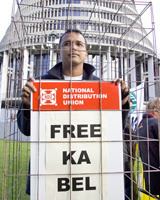 NDU site delegate Daniel Patea said that Filipino workers and unions had supported the locked out workers. The NDU and the Council of Trade Unions said they would ask the Prime Minister to get assurances from Arroyo that Maga will not be arrested. Maga told reporters in New Zealand that he feared he would be assassinated or arrested for his stand. He said human rights abuse was continuing in the Philippines. "I am really worried for my family's safety because they might invent a charge against my father and my wife and my family just to pressure me to return to the Philippines," he said. The Filipino leader ended her three-day state visit in New Zealand and Presidential Assistant Heherson Alvarez said Arroyo is bringing home at least $1.22 billion in investments. From this amount, the biggest beneficiary is the environment sector with $1 billion going to a reforestation project, $150 million in a gold mining deal, $40 million for the local wood processing industry, and $30 million for the export of Philippine tropical fruits to New Zealand. Alvarez said the $1 billion reforestation project which Arroyo announced during the meeting with the Filipino community in Auckland would be financed by CK Tan of Shannolane, based in New Zealand. The reforestation project in Prosperidad town in Agusan del Sur province in Mindanao is scheduled to start as early as October this year.